Pakistan’s top leaders would not delegate advance authority over nuclear arms to unit commanders, even in the event of crisis with India, a senior official said Saturday. 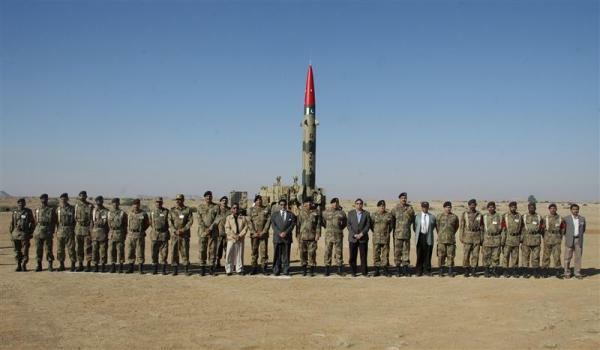 The revelation might slightly ease global concerns about Pakistani nuclear arms being detonated precipitously in any future combat, though plenty of potential hazards appear to remain, the Global Security Newswire (GSN) said. “The smallest to the largest – all weapons are under the central control of the National Command Authority, which is headed by the prime minister,” according to the high-level Pakistani government official, speaking to reporters Saturday on condition of not being named. The longtime worry has been that Pakistani military units might be tempted to use battlefield nuclear weapons as a last resort. One possible scenario for such a move might be if Pakistani troops are in danger of being overwhelmed in any future war against India, which has a larger and more capable conventional army, as per US officials. The two nations currently field roughly the same size nuclear arsenal, numbering around 100 weapons apiece. Prime Minister Nawaz Sharif, who was elected to office last spring, has moved to strengthen ties with his Indian counterpart, Manmohan Singh, following a string of border killings. The senior Pakistani official acknowledged, though, that ultimately any battlefield use of tactical nuclear arms is left in military hands, as would be the case in virtually any nation’s combat operations. “You must appreciate, in almost all the countries of the world, final operational control lies with the military, even here,” the Islamabad official said at the Washington gathering. “But the basic control remains with the civilian leadership, in consultation with the military commanders. And the usage will be controlled at the highest level, even if the smallest device in the smallest numbers has to be used”. The senior figure was asked if Pakistani military commanders, once given emergency authority to detonate nuclear weapons, might set off the deadly devices rather than allow potentially dominant Indian troops to overrun and steal them. “I think principally I should take offense to this remark,” the official said. “We are not so naïve to handle nuclear weapons, to hand them over to a conventional army coming to our borders. There are no chances of that,” he said, adding that if Pakistanis can develop nukes, they can look after them as well. Referring to the high caliber of both the nuclear technologies and the Pakistani troops, whose dedicated mission is to secure the atomic arms, the official said the Pakistani military commanders “would rather commit suicide than let this fall in somebody else’s hands who’s not supposed to have it”. Asked subsequently about the US concerns regarding Pakistani security over its stockpile – particularly after militants have attacked armed forces installations in recent years – the official said that nuclear safety is of paramount priority to the nation’s leaders.